I'd heard rumors but hoped they weren't true. 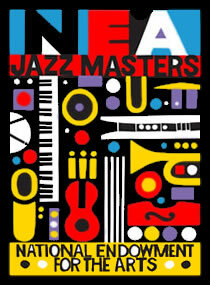 The National Endowment for the Arts plans to eliminate its Jazz Masters award. 2012 will be the 30th and final year of this prestigious award, the nation's highest honor for jazz, often called the only American art form. Since 1982, 119 artists and groups have received the Jazz Masters fellowship, which includes a relatively modest $25,000 grant and opportunities to participate in educational programs across the country. I'm guessing that when the Jazz Masters award goes away, so will the rest of the NEA's jazz initiative, including NEA Jazz in the Schools, NEA Jazz Masters Live, and the Smithsonian Jazz Oral History Project. NEA Jazz Masters Live is administered by Arts Midwest, one of six regional arts organizations in the United States, with offices in downtown Minneapolis. Late last year, I worked with Arts Midwest to award the 2011 NEA Jazz Masters Live Grants, which will send several Jazz Masters to communities across the nation to perform, teach, and spread the jazz message. There's no news yet on how many artists will be recognized, or the size of the award, just that the program will be "less expensive." As jazz writer Howard Mandel commented, "Receiving an American Artist of the Year Award may become tantamount, odds-wise to winning the lottery." As NPR's Patrick Jarenwattananon reported in A Blog Supreme, "The budgetary news comes in the heels of a heated discussion in the arts administration community after NEA chairman Rocco Landesman asserted, during a theater conference, that the U.S. had too many arts organizations compared to the size of its audiences. 'You can either increase demand or decrease supply,' he said. 'Demand is not going to increase, so it is time to think about decreasing supply.' He later expanded on his thoughts online." In his online remarks (on the NEA's official blog), Landesman noted that "arts education is one of the only reliable predictors of future arts participation. Not age, race, ethnicity, or income level, but arts education. Exposure to the arts—early and often—builds future audiences." Hold that thought as you read this article about the Toledo public school system, whose Board of Education has just decided to cut the art and physical education programs in the city's elementary schools. During a follow-up radio interview, a B of E member suggested that children could learn about music in church. I don't get the sense that Landesman cares much about jazz one way or the other, or recognizes its significance to America's cultural landscape. I miss Dana Gioia, Landesman's predecessor, who got it. (A poet, critic, and composer, Gioia is brother to Ted Gioia, author of several books about jazz including The History of Jazz.) And I'm awaiting Willard Jenkins' response to the NEA's decision about the Jazz Masters. Jenkins, a journalist, arts consultant, and presenter, is coordinator of the Jazz Masters Live program. Loss of the Jazz Masters program is small potatoes compared to loss of funding for Planned Parenthood, PBS and NPR, etc. One difference is the Jazz Masters program is being voluntarily shut by the NEA itself -- the Senate and House will be arguing over funding for these other programs (and my bet is the insistent urgency re budget cutting/deficit reduction is the usual strategy by America's most conservative representatives to throw up a lot of smoke to confuse the issues that really matter, like huge tax breaks for the wealthiest individuals and corporations). It's my personal opinion that if the jazz community does not stand up and say that it exists -- whether we can have Jazz Masters Awards celebrated with big concerts at Jazz at Lincoln Center or not -- it will be ignored in a way that puts us back more than 30 years, even before Rep John Conyers got the amendment recognizing jazz as a American treasure passed. Howard, one of the things I find most disheartening is the lack of NEA support for one of its own programs, and the apparent belief that jazz doesn't merit special recognition.